This week is a busy one in Ibadan. For instance, today, Wednesday, the nation’s First Lady, Aishat Buhari, is visiting Ibadan for the Florence Ajimobi-convened National Women’s Summit. But there’s one event that I’m looking forward to most, it is the Ibadan TechJam 2016. Yesterday, I chatted with the Chief Convener of the event, Oluwamayowa Oshidero, and he affirmed that the tech ecosystem in the city is ready for disruption considering the fact that many of the country’s successful startups have ties and links to the city of Ibadan. What I can agree with him about is the existence of a brain drain process that steals best brains from Ibadan and plug them elsewhere. “A bunch of big startups in the country can trace their starting up to this city, And it seems the state has been in a continuous state of loosing it’s resources as great talent head out in search if greener pastures. Well, the lack of technology adoption is a contributing cause for the seemingly low spending powers of the citizen,” Oshidero told IBPulse. The idea is almost similar to what IBPulse is achieving with its After5ive initiative and I’m very happy that there is yet another event in the city that is targeted at the creative minds and refreshes the entrepreneurial spirit among the young demographics in the city of Ibadan. He told me that they’ve already put up billboards, leveraged media partners across the countries (with their kind support), and they are running online ads as well as official invite to companies to invite their top level staffs. So I asked him about the breakdown of registered participants and he said they include 40% young graduates/undergraduates, 30% corporate staff, and 30% business owners. Our discussion ended with him talking about why Ibadan’s tech landscape is ready and how TechJam is well positioned. He observed that internet usage of the city is on the all time highest, there are more than 3 technology hubs already, and about 3+ sound and reputable digital agencies already that working day and night to empower tech solutions and create excellent services for SMEs. “In other words, things are happening in Ibadan already. TechJam would just help to expose these things and to encourage their scale up as well as opening up of new ones,” he said. 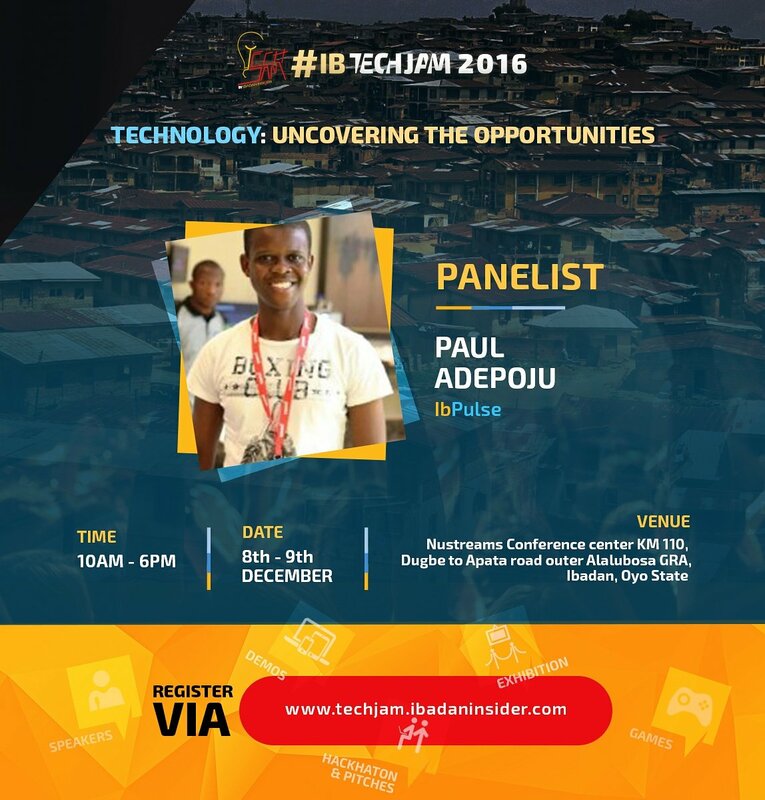 PS: I’ll be speaking on a panel at Ib TechJam 2016 on Friday, let’s connect and share ideas.